Carolina is NOT getting in the same one-and-done game as Duke. As expected, both Nassir Little and Coby White announced they were entering the NBA draft with no chance of coming back to school since they are both projected lottery picks. So with eligibility over for Cam, Kenny and Luke, the Tar Heels are losing four starters and their top five scorers off their most recent No. 1 NCAA seed. However, help is on the way with five-star center Armando Bacot and most of the recruiting services saying that five-star point guard Cole Anthony will put on the Carolina cap when he announces his decision in mid-April. And there may be another four- or five-star out there who wants to join the class that also includes three-star guard Jeremiah Francis. 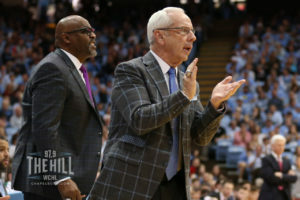 Without those added 5-stars, Roy Williams would have a representative team next season because he is still doing it the old-fashioned organic Dean Smith way of building from within. Garrison Brooks, Seventh Woods, Brandon Robinson and Leaky Black, who showed great potential before missing six weeks with a high ankle sprain, are the primary of seven returning lettermen who played in practically every game when healthy. Add Bacot and Anthony to that mix and you have another ACC contender. Duke, on the other hand, will turn over its supposedly greatest recruiting class ever for another five-star crop of freshmen who will make career reserves out of one-time five stars Marquise Bolden and Javin DeLaurier, who have been recruited over for the third straight year. Depending on how the new freshmen come together, there may be at least one starting spot open for legitimate competition. When asked if he liked it better the old way with the Hurleys, Hills and Laettners staying four years, Mike Krzyzewski nodded his head. But this hasn’t been a good week for the 72-year old Coach K.
Not only did his latest all-star recruiting class and his most transcendent star – prohibitive favorites to win an NCAA title – not even get to the Final Four for the fourth straight year, the peak of his wholesale one-and-done system is being called his greatest failure. K says that is how the game has changed and UNC will face the same thing. Not quite. Little and White are Ol’ Roy’s fourth and fifth one-and-dones in 16 years, compared to more than a dozen Duke has had in the last nine. The difference: Carolina’s core still remains.